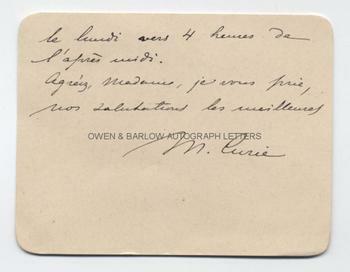 MARIE CURIE Autograph LETTER Signed. Polish born French physicist and chemist. The first female winner of the Nobel Prize and the only women to have won the prize in two disciplines. Pioneering scientist in the field of radioactivity, a term that she coined. ALS on correspondence card, together with original envelope. 2pp. No place, no date [but envelope is postmarked Montparnasse, Paris, 1904]. To Lady Head, inviting her to visit the Curies at their laboratory. In French. Trans: "Madame, We would have great pleasure in seeing you again but we do not have a moment free this week. If you are still here next week, you will find us at our laboratory in La Rue Lhomond 42 on Monday towards 4 o'clock in the afternoon. . . " [etc]. 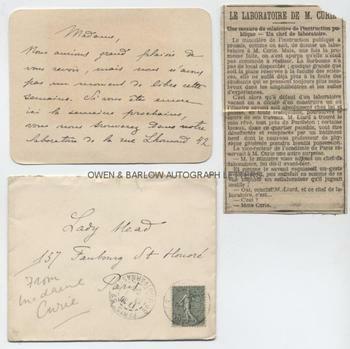 Loosely inserted in the envelope is a contemporary news cutting from a French newspaper relating to the Curies' laboratory. The recipient of the letter is probably Lady Florence Julia Head nee Pollock (1853-1931) wife of Sir Robert Garnett Head. She was an active member of the Ladies Athenaeum Club and a friend of the French actress, Sara Bernhardt. 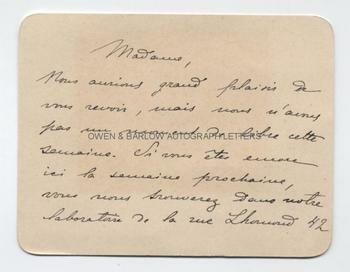 Letters of Marie Curie are rare and they are one of the most desirable of 20th century science AUTOGRAPHS.